In the first part of this series of articles, I looked at why there is a need for efficient metadata operations management. 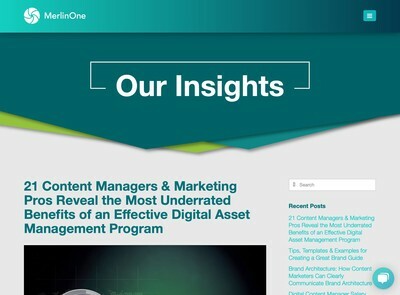 While the use of DAM systems to hold digital assets has increased significantly over recent years, the quality of the cataloguing of many assets is becoming an increasingly critical issue that threatens to constrain the ROI that can be obtained from Digital Asset Management. In the remainder of the series, I will examine various operations management strategies and tactics that can employed to make this process more streamlined. The metadata analysis carried out prior to implementation of a system may well have already identified classifications along these lines and they might already be present as options to choose from when cataloguing assets. If so, this can be used to help direct cataloguing effort more efficiently right away. If it has not been considered previously, it usually makes sense to start to define assets according to a classification method like the one above, but it may be unproductive to go back and try and retrospectively apply it to everything already ingested. As I will discuss in the follow-up articles, there are some automated methods you can use to take care of the worst of the drudge work. These usually require immediate release; it is imperative that they are made available to asset users very soon after origination. The cataloguing requirements are more about getting assets into predictable classifications and tagging them with a small number of widely used and understood keywords (e.g. names of key people, events or products and services). Many news-related assets have limited long-term value after the period when they are released and the cataloguing requirements must reflect that (although some selected noteworthy assets may need to be retained for use, as described below). Photos or videos of conferences, events, trade shows or external events which the organisation is heavily involved with. These types of assets must be released by a strict deadline in order for them to be of maximum value, but there might be a longer period of time between asset origination and release than news related assets (in fact releasing earlier than planned may be undesirable). It is essential that these assets can be found and that they achieve prominence to reflect the emphasis the business places upon the subjects they represent. The cataloguing work, however, must not cause their release to be delayed or so arduous that the users uploading them decide not to bother doing it. Although they have a longer shelf-life than news or topical assets, they will have a significance which potentially diminishes as new initiatives are launched to supersede them. As with news assets, some items may acquire a longer-term value and they may transition from one classification to another over time. Artwork and promotional material for new product launches or seasonal marketing campaigns. These are assets which have a longer usage period and the majority of employees in the organisation may need to get access to at some point (certainly anyone with a communications oriented oriented role). These are normally the most popular assets in terms of searches and downloads, as measured across the system’s lifetime. They need to be catalogued more diligently than anything else as a result and should be carefully vetted prior to release. Core assets need to be easily found using widely understood terms – both inside the organisation and potentially by external users who may be given access. Although the metadata must use brand-compliant terminology, synonyms might be employed to ensure that anyone searching using older descriptions or common spelling mistakes etc will still find relevant results even though they will not be used in metadata which is visible to regular users. Core assets may also be grouped into pre-defined collections and linked to from prominent locations to anticipate the higher demand for them. Over a period of time, many of the assets in this group will eventually be replaced and their role becomes more historical/archival in nature, but their popularity will extend over a far longer duration than some of the other segments mentioned earlier. Archival assets may be older materials digitised from collections of assets the organisation already has stored in analogue form. This might also include original digital assets which have diminished in importance over time. Any existing metadata should not be discarded, but unless users are specifically looking for historical assets, search algorithms should either suppress them or reduce their priority so they do not interfere with more current material. Depending on the size of the library, it might be beneficial to keep these in a segregated collection which users access separately or need to explicitly ask to be included in searches. If assets lack any prior metadata then cataloguing of archival assets can be sub-contracted to external suppliers (with quality control provided by in-house subject experts) although if they are deemed of key historical value (e.g. old photos or illustrations of founders etc) then this may not always be suitable. Artwork of withdrawn products/services, old logos, promotional materials from campaigns that have ended, former senior employees who left the organisation some time ago. Work in progress assets can be either materials which are still being approved or they might be composite elements (i.e. combined with others to generate a piece). The latter may co-exist in two segments simultaneously since they may be used for one of the other purposes previously described and as composite supporting items for a work in progress asset. If the sole purpose of the DAM is not just work in progress, most of these assets should be suppressed from conventional searches unless the users looking for them both have permission and have made a specific request to find them. 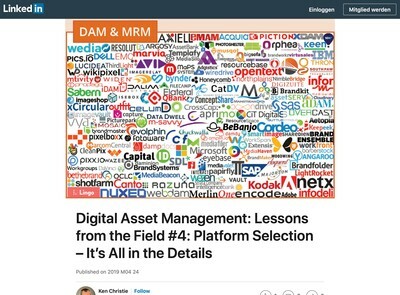 Since the emphasis is on ensuring that production staff place assets into the DAM, much of the metadata should be derived using automated methods like workflow contexts etc to avoid placing barriers to getting assets into a repository. Some DAM systems which are closely linked to production workflows might automate this task (to varying degrees) by scanning working folders or by finding assets that have been used in print artwork. For work in progress assets that will become final assets (or composite assets that might need to be re-used) some opportunities for allowing assets to be catalogued descriptively should be permitted to anticipate the point when they are finalised and released. Relating work in progress assets to a given master (for example all photos used in a brochure) can provide a en effective method to help users find relevant assets both during production and afterwards. Complex collateral assets collectively originated by more than one person (e.g. multi-page print assets, videos, animations) or associated composite assets that they are derived from. The above analysis demonstrates that different groups of assets can have potentially quite diverse metadata cataloguing requirements. Applying a single approach to all of them is highly inefficient and results in excessive work being carried out for those that do not require it and inadequate level of effort applied to those that do. Many busy corporate DAM users who have a lot of other tasks to get on with will simply not bother to carry out the cataloguing work to any degree necessary to generate useful results. If the cataloguing is tailored towards the planned use and the significance of each group clearly explained during training, however, then it is more likely that effort will be expended where it will yield a higher return. The last item is particularly important: assets have a usage lifecycle and very few (if any) are likely to remain in a single phase indefinitely. As well as determining at which one is most relevant, it is also critical to have a process to identify when they should move between key stages and what to do with them when that happens. 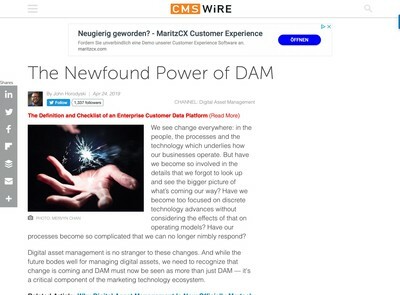 Many of the strategies currently employed in DAM solutions are based on an earlier period when the key users tended to be more active in the media industry, especially publishers who were also some of the earlier adopters. Organisations of all kinds now generate a lot more communications output – to the extent they now have some operational characteristics which are similar to conventional media businesses. In addition, the range of channels they distribute content to varies widely and this impacts the nature with which they need to catalogue their assets so the most suitable material is available in a timely and relevant manner. 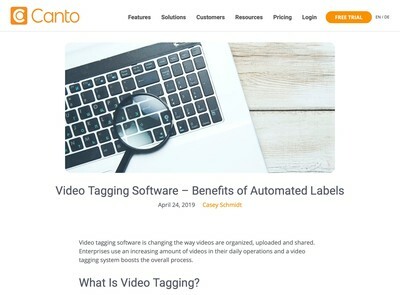 With that in mind, segmenting cataloguing in the manner described is likely to become the only practical way to stay on top of this task as time goes on and asset volumes continue to grow. In the follow-up articles, I will examine some further methods by which asset cataloguing can be made more efficient while still preserving overall findability. This will include some investigation of automated methods (including their pitfalls) outsourcing options, employing user feedback and further approaches to sequencing or prioritising cataloguing tasks.